Shares of the airline dropped on broader market weakness and concerns about rising fuel prices. Shares of American Airlines Group Inc. (NASDAQ:AAL) lost altitude in October, falling 15% according to data from S&P Global Market Intelligence. Rising fuel prices and the broader market sell-off weighed on the stock, and even a pop on its third-quarter earnings report wasn't enough to overcome the headwinds last month. Rising fuel prices seemed to weigh on American Airlines and its peers in the first half of the month, as did Hurricanes Florence and Michael, which were expected to affect third- and fourth-quarter results. American shares fell 12% from Oct. 8 to Oct. 10 in anticipation of Hurricane Michael, and as rising interest rates sparked a broader market sell-off. The Fed's interest rate hikes could weigh on American's results -- the company carries a heavy debt burden of $25 billion. However, the airline redeemed itself somewhat with its third-quarter earnings report on Oct. 25, which sent shares up 7%. Revenue increased 5.5% to $11.6 billion, but profit fell due to rising fuel costs as earnings per share came in at $1.13. That was down from $1.50 a year ago, but matched expenses. Management said higher fuel prices were the cause of the lower profit, costing the company an additional $750 million out of $10.7 billion in total operating expenses. Still, the stock rose as passenger revenue per available seat mile, a key industry metric, rose 1.8%; investors seemed to be encouraged by the company's maintaining its EPS guidance at $4.50 to $5.00 per share for the full year. 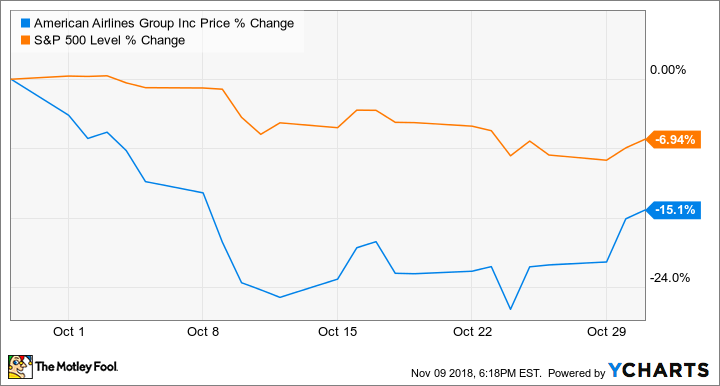 The stock's momentum toward the end of the month has continued into November as oil prices have recently fallen, and shares of American Airlines still look dirt cheap based on this year's expected EPS at a price-to-earnings ratio of between 7 and 8. Airline stocks have largely fallen this year on concerns about rising fuel prices, but as the recent turnaround in American shares shows, that sell-off may be overdone. If oil prices continue to fall, don't be surprised to see American and other airline stocks rising.